Dental care is a vital part of keeping your child healthy. Having a good relationship with a dentist when a child is young helps to maintain a beautiful smile throughout their life. Pediatric dentists receive extra training in child psychology and pharmacology, which provides a higher level of care for your child. Here are the 10 best in Oklahoma. This southern Oklahoma dentist gets high reviews online. Their practice focuses on dental care for infants, children and adolescents to have a healthy smile now and into adulthood. This office is highly-rated across the board and for good reason! It bills itself as a modern office for children and adolescents, with high-tech equipment in a comfortable environment. In most rural communities, dental offices serve families. In southwest Oklahoma, Sheppard Dental Care is one of the best offices for kids. The office team is friendly and welcoming. The atmosphere is relaxing and inviting. The techniques are the most up-to-date. You’ll find compassionate dentistry and high-tech equipment at this northeast Oklahoma dental office. This office focuses on prevention of disease through giving kids and parents knowledge and tools for healthy teeth. Tulsa has many excellent dentists for children, but this one is among the very best. Dental stations have televisions to give the child something else to focus on while getting treatment. 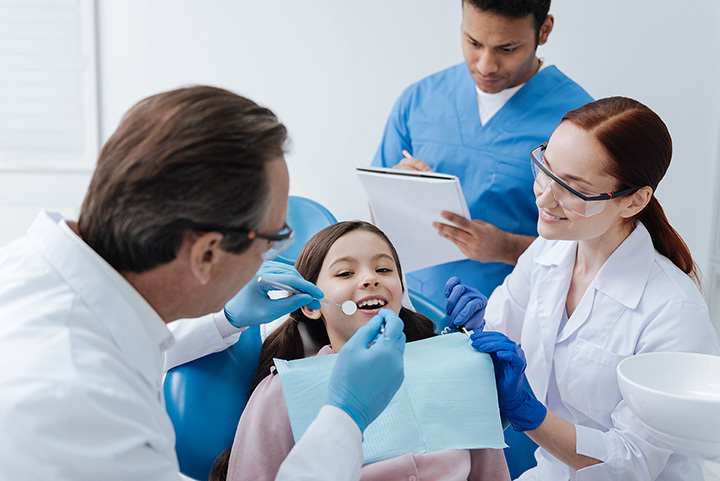 Staff is well versed in explaining procedures to children and helping them establish a good dental routine. This pediatric dentist comes highly recommended for children of all ages. Your child will have positive experiences with dental care in this modern office that is comfortable and inviting. First dentist appointment!! No cavities just like brim!! A family dentist in central eastern Oklahoma that provides great care for children and adolescents. Drs. Auld were both born and raised in McAlester, and they both are active in the community. Although this office handles orthodontia care, many teenagers require braces as part of their dental health. It gets rave reviews from parents online. Dr. Williams is a leader in his profession and in the community. This office provides great family care with a focus on children. It accepts Sooner Care, speaks Spanish and can see emergencies on the same day. Dr. Jake has a heart for Oklahoma families and children. One of the top-rated dentists in the Oklahoma City area who serves infants, children, teens and children with special health care needs. Dr. Guthrie was raised in Oklahoma and although he went to dental school in Indiana, he returned to his home town to serve local children with high quality dental care.